Lancombes House Cottages offer self catering accommodation just outside of the village of West Milton, near Bridport in Dorset. The self catering holiday cottages are all part of a two hundred year old converted barn and farm buildings, arranged around a courtyard. Whether you are looking for a quiet getaway on your own, or with a big group, you will find accommodation to suit. Buckingham offers single storey accommodation for up to 4 guests. A wheelchair ramp is available for access. There is a spacious open plan living/dining area with a fireplace and wood burning stove, a fully equipped fitted kitchen, one large double bedroom & one twin bedroom. 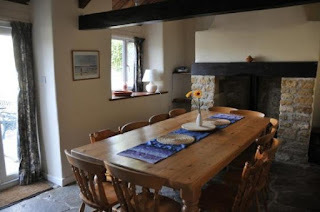 The Farmhouse can sleep up to 12 guests & comprises of six bedrooms, three bathrooms (two en suite), a beautiful large, wood kitchen with a range style cooker, open plan dining area and a large lounge. The Farmhouse has its own BBQ area, with gas BBQ and seating overlooking the valley down to the Jurassic Coast. Tanglewood can also sleep up to 12, in four double bedrooms, one twin & two single bedrooms. Facilities include three bathrooms, a beautiful dining room with a flagstone floor, and a lounge with exposed beams & comfortable seating. Located onsite is a games room with a pool table, CD player, outdoor games equipment, board games, comfortable seating and a range of books.